Few food holidays get me more excited than National Taco Day, which is today! Tacos are perhaps the one meal my little family can all agree on, and one that my kids will eat without (too much) complaint. That’s because tacos are the ultimate finger food, are endlessly customizable, and can be served up in a variety of ways. Follow these basics to make taco night new and interesting each time you serve it up! Figure out the Foundation. There are several choices to make when it comes to the foundation of a taco, beyond just soft or hard shell. There are flour or corn tortillas (and then white, yellow corn or even blue corn?). Or, go carb-free and wrap in a piece of butter lettuce or place your taco fillings atop a salad. Pick your Protein. 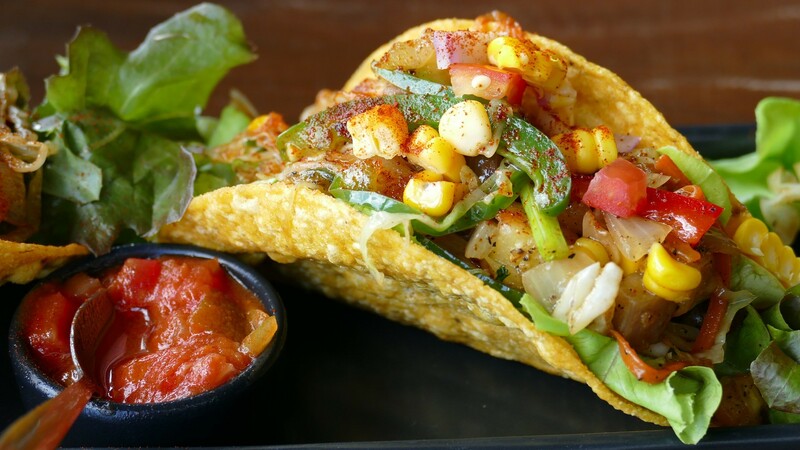 The protein component of a taco is usually its defining feature: are you having steak, chicken or fish tacos? Don’t limit yourself to the standard ground beef: there are so many protein options. Even mix and match, with ground meat and beans. Add Volume with Veggies. Tacos are a good way to pack in at least a couple servings of vegetables, either within the taco itself (hint: beans are a protein AND a veggie!) or as a topping. A family favorite is to make homemade salsa fresca with just tomatoes, red onion, cilantro, some salt and lime juice. In-season veggies are often fresh and abundant, but you can also throw in anything that’s starting to show its age and would otherwise be destined soon for the trash heap (waste not!!). Broccolini, sautéed spinach, baby bella mushrooms and roasted sweet potatoes are all yummy options. Top it Off with a Light Touch. A well-built taco needs just a few enhancements to top it off – no need to go overboard. Salsa, fresh avocado or guacamole are great veggie toppers that supply a lot of nutrients. Cheese can give a salty-savory dimension, but just a little can go a long way. Strong flavors such as sharp cheddar or queso blanco require just a few bits without overpowering each bite. I’m not a fan of sour cream, but if that’s your jam then go for it. Just a little dab’ll do ya, though! 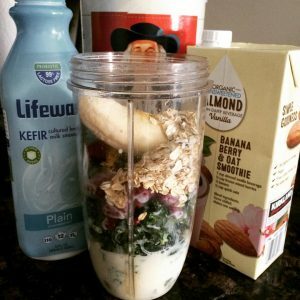 The fillings, toppings, and combinations are endless with this extremely versatile food! There’s no right or wrong way to build a taco. 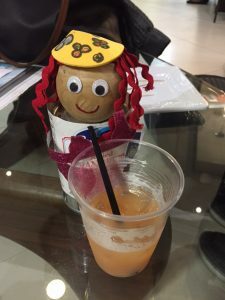 And for your little ones, you can make them as kid-friendly as you’d like! 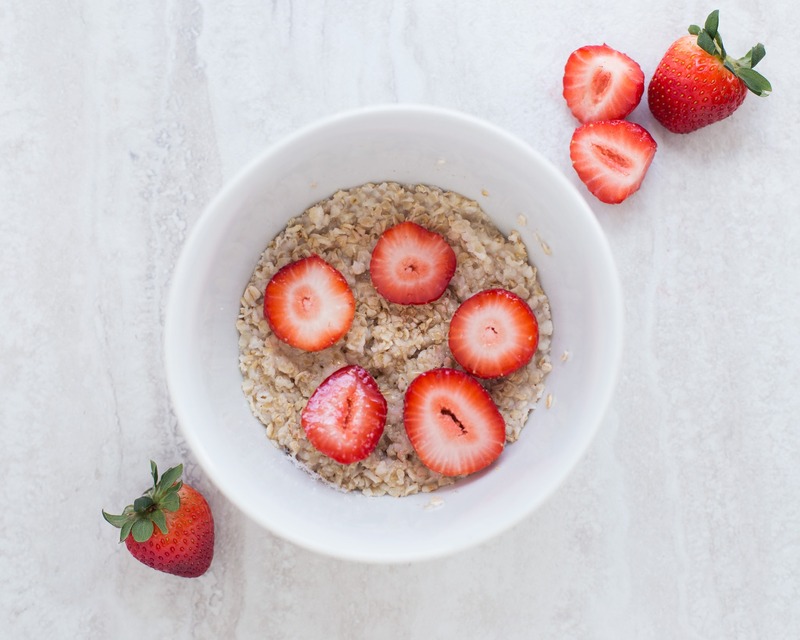 Here’s one of my new favorites from my friend and fellow dietitian, Sara Haas. I use a combo of ground turkey and pinto beans for my recipe. Adiós amigos and enjoy your tacos! P.S. I just found out about a great contest from Uncle Ben’s. The Uncle Ben’s® Ben’s Beginners™ Cooking Contest inspires families to cook together. Enter online before midnight Monday, October 9, 2017 for a chance to win $15,000 for your family and $30,000 for a school cafeteria makeover. I have no affiliation with this contest nor am I being paid to promote it, but how could I not let you know about this amazing chance to win some serious cash not just for you, but for your school??? Five winners will be chosen. Thanksgiving is my favorite holiday – but it wasn’t always. That’s because yeah, while Thanksgiving is all about family and giving thanks, it’s really all about food. 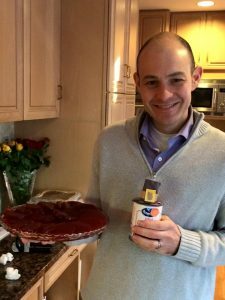 Although my preferences have changed over the years, when I was younger I didn’t like any of the traditional Thanksgiving foods (except for dessert – mmm…warm apple pie!) 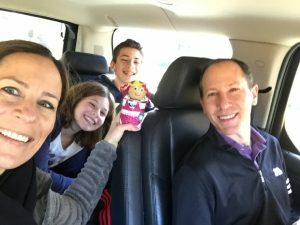 In my teen years I remember my mom’s Thanksgiving table included the usual turkey (yuck), stuffing (never liked it), and a smattering of unusual side dishes (Israeli salad? Not exactly what the Pilgrims ate). After whining and complaining as my mom was planning the next Thanksgiving she offered to make one side just for me. “Green beans,” I told her. Green beans with what, she asked? “Just green beans. Steamed.” She shrugged, but she made it. And I ate it. That, and pie. Years later the Thanksgiving hosting duties were shifted to my older sister, who gave a gourmet twist to Thanksgiving. We didn’t have just turkey, but picked-from-the-farm, homemade-brined, cooked-on-The Big-Green-Egg organic turkey (luckily by then my aversion to turkey was a thing of the past. My brother-in-law’s turkey is soooo gooood!) Sides were multicolored cauliflower, brussels sprouts with pancetta and shallots, homemade stuffing with chestnuts and fresh herbs, cranberry chutney. And that was just what my sister and her husband made. The multi-family and -friend feast was a potluck, and everyone was encouraged to bring their favorite food. My husband’s contribution? Canned cranberries. 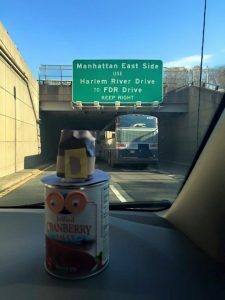 Our joke was that we needed to give some balance to the gourmet-ified Thanksgiving, but the truth is canned cranberries – in all its ridged and sliced glory – is a key element of my husband’s Thanksgiving tradition. 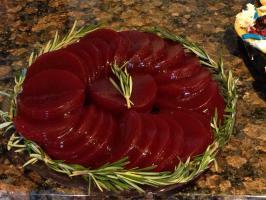 It starts with the perfect can of Ocean Spray jellied cranberries (store-brand or frou-frou versions need not apply! 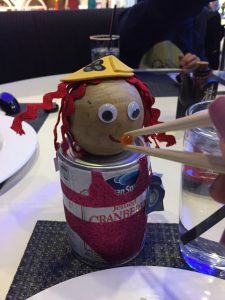 ), carefully opening the lid and letting the gelatinous contents fall out in one audible “thwap” in a perfect can-shaped form, then sliced uniformly into round full moons, and displayed lovingly on a plate. 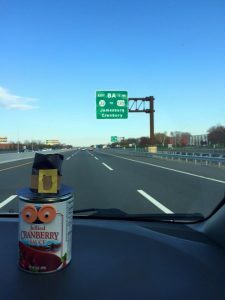 The best part – when the canned cranberries and the cranberry chutney were served side-by-side on the buffet, guess which went faster? Yup. Don’t mess with tradition. One year another guest took it upon him or herself to plate the cranberries, deciding to “pretty” it up with some fork-fluffing. The look on my husband’s crestfallen face was priceless. After that, we guarded the can until the timing was perfect to unleash the cran-goodness. 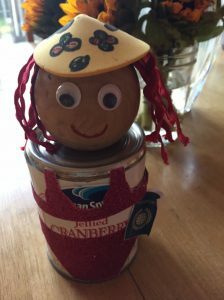 Last year we had some fun with my sister: we dressed up a can of cranberries like a Pilgrim, named him Crandall, and documented his journey from can-to-plate. 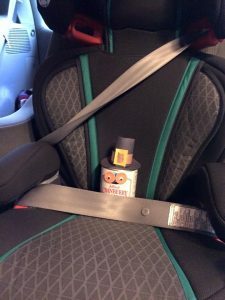 All buckled up – safety first, of course! No time to visit the relatives! As with most traditions, Thanksgiving has evolved for my immediate family. We now rotate years, going to my sister’s house every other year and my husband’s family in the opposite year. 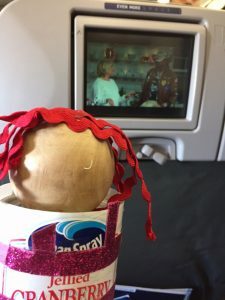 This year was also a change for my sister as she took a year off (after 11 straight years of hosting duties) and flew to the nearest tropical island with her family. Can you blame her? So this year, in our absence, we sent Crandi. So far, she seems to be having a blast. Rum punch upon arrival. Vacation has begun! It’s Thanksgiving – and it’s all about family, food, and having a bit of fun. Happy Thanksgiving! Go ahead…play with your food.